The Taylor digital luggage scale is overall a pretty average luggage scale. It will likely measure your luggage with enough accuracy to avoid a luggage fee, but there are definitely better scales you can get for a similar price. Founded over 150 years ago, Taylor Precision Markets has a rich history. They helped streamline the manufacturing world during the Industrial Revolution and manufactured critical precision instruments in World War I and II. Today, it specializes in a variety of precision instruments, including scales, thermometers, clocks, and hygrometers. 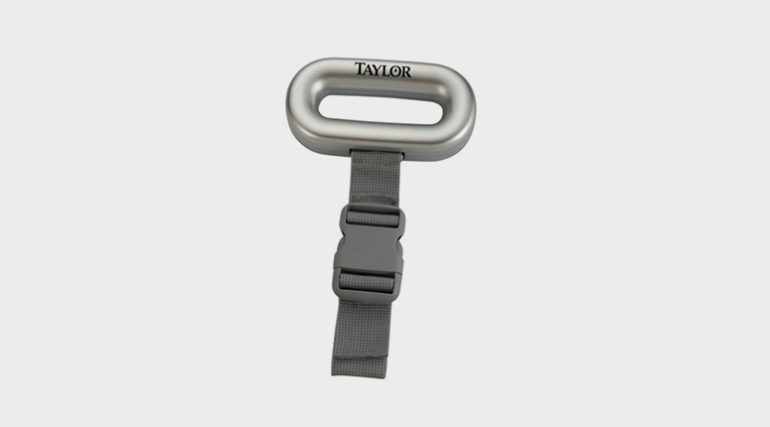 To use the Taylor luggage scale, wrap the strap around the handle of your luggage, fasten the buckle, and lift the scale using two hands. A beep will indicate when it is finished taking the measurement. Be sure to lift with two hands, as you will have a more secure grasp on the scale, which will make the reading more precise. 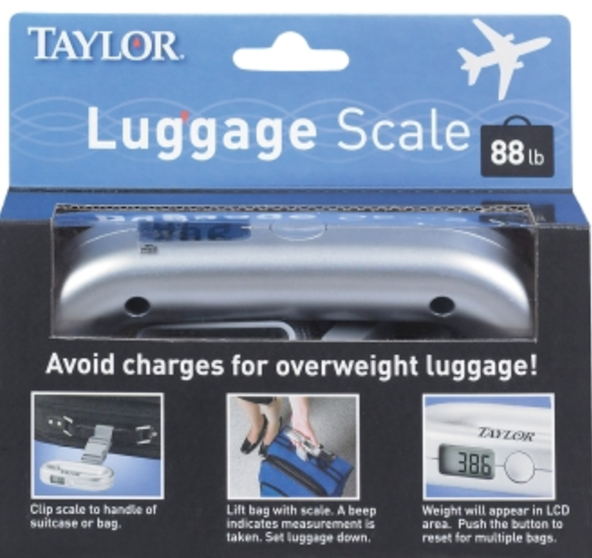 The Taylor luggage scale is comparable to the Precision Voyager luggage scale. It has the same circular design making it easier to grab and lift heavier luggage. 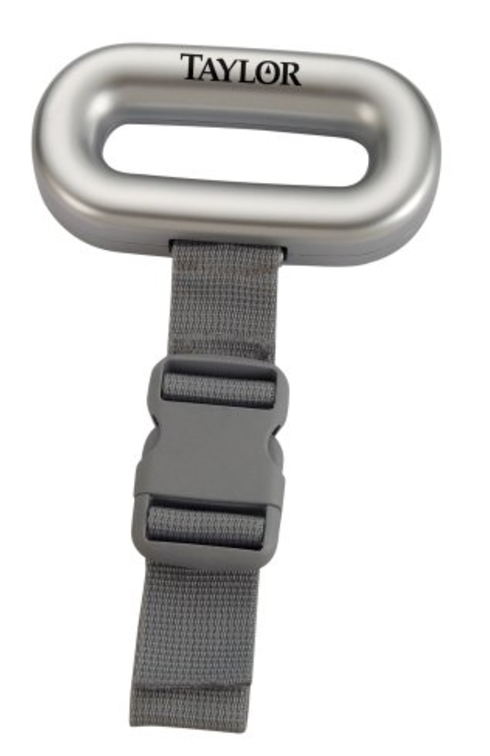 The strap also has a buckle, allowing for an extra secure grasp on your luggage. These helpful features also have the downside of making the scale a little bulkier, which might make it slightly less convenient to carry around. Check out the Balanzza for a different type of design. The circular grip design is really a great feature. In my opinion, it is considerably easier to lift heavy luggage with this kind of grip, versus the horizontal bar design. But aside from having that advantage, this scale is pretty much just your run of the mill scale. There are no fancy additional functions. It can also only weigh up to 88 pounds, versus the standard 100-110 pounds. But since you generally will only need to know if you’re under the standard 50 pound limit, it won’t stop you from avoiding those overweight luggage charges. As for accuracy, the greatest inconsistency was a difference of a little under 0.4 pounds for one bag and about 0.2 pounds for a slightly smaller bag. So it was fairly consistent, but if you’re approaching that 50 pound limit, the discrepancy could cost you. Overall, this is a decent scale but probably not my first choice. It’s circular grip does make it easy to use, but you can still find some better options for a similar or even smaller price, like the Precision Voyager. Interested in Purchasing the Taylor Precision Products Digital Luggage Scale?